Whether you are remodeling or installing a new bathroom, you’ll want to get ideas for decorating it. Designing a small bathroom may be a challenge, but with the right combination of fixtures, surfaces, colors, decor, and lighting, it’s doable! Even when space is limited, a bathroom can still serve many functions. 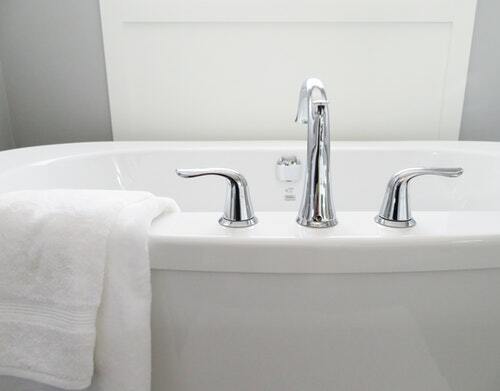 If you a homeowner who wants a peaceful escape from daily stress in a nice, comfy bathroom, here are some ways you can maximize the look of your small bathroom. Because small bathrooms can have big style, too! Choose a shower curtain that looks more like a drape rather than your traditional plastic one. It will not only make the room feel more sophisticated but also make the shower feel like more than just space reserved for later use. Lighting can go a long way towards creating an illusion of a spacious room. As much as possible, take advantage of the natural light coming through the windows of your bathroom. Chrome shower accessories like the door handle, knobs, and even drain, add decorative elements to the bathroom. They allow the bathroom designs as a whole to feel clean and open but never overwhelming. Create the illusion of a much larger space with mirrors. Light bounces off the reflective surfaces that even a tiny mirror makes a huge impact on the look of a space. It turns out mirrors are not just for touching up your makeup! Why use a door on a hinge that will only take up more space when you can opt for a sliding door that stays parallel to the wall at all times? Don’t let your bathroom look too overwhelmed with patterns and colors. If you design it with intricate details of elaborated tiled floors, remember to keep the rest of the tiny space simple.